"Thank you so much for your book! It was an eye opener for me. I have recommended your book to all the international students in my network." Studying in America is a powerful first step towards making U.S employment a reality, but each year thousands of international students are surprised to discover that it takes more than an American degree to get a job in the U.S. You need an understanding of the unique challenges facing international students, and a strategy with proven success in overcoming them. Power Ties delivers both. The H-1B visa is the typical form of work authorization used by international students for U.S. employment. But in order to get an H-1B, you need a job offer from a company willing to “sponsor” your visa. Unfortunately, most companies don’t regularly sponsor H-1B visas. They sponsor only when they have a compelling business reason to do it. Your job is to provide them that compelling reason, and Power Ties: The International Student’s Guide to Finding a Job in the United States will show you how. Despite the challenges, there is a reliable path to H-1B sponsorship that has been travelled successfully by many international students before you. 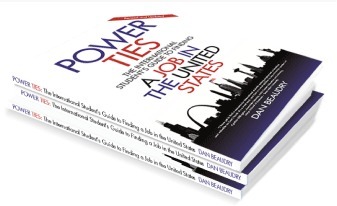 Power Ties author, Dan Beaudry draws on over 15 years of experience in recruiting and working with international students to reveal a system that gives you your best opportunity to secure a job in the United States. It is a system that has been endorsed by career services professionals from some of America’s best universities. You’ll find that system here. Don’t rely on chasing listings of companies that have sponsored H-1B’s in the past. Don’t give up when you hear from human resources departments that they don’t sponsor visas. Get your guide to finding a U.S. job and discover how much control you really have over your future. What is a job in the United States worth to you? There are no short cuts. Start the journey today on the right path, and you’ll be getting U.S. work experience while others are still sending out resumes. Ready to move forward with your U.S. career? Click here to purchase the book Power Ties: The International Student's Guide to Finding a Job in the United States.